NEW YORK--(BUSINESS WIRE)--Academy Securities, a registered broker-dealer, certified Disabled Veteran Business Enterprise (DVBE), and Minority Business Enterprise (MBE), today announced the addition of Matt McQuillen as Managing Director, Co-Head of Short-Term Liquidity. Mr. McQuillen will partner with Joseph Tarditi to run the firm’s new Short-Term Liquidity desk. Mr. McQuillen brings considerable knowledge and expertise to the firm, having served in the financial services industry for nearly 30 years. Prior to joining Academy, Mr. McQuillen was Global Head of Short-Term Funding at General Electric with responsibility for the management and direct-issuance of GE Capital and GE Company’s commercial paper programs. Previously, Mr. McQuillen managed GE Capital’s asset-backed commercial paper programs and held various sales and liability management roles at the firm. 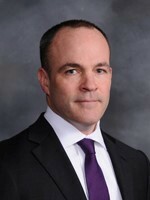 Mr. McQuillen began his career at Merrill Lynch in 1990 in fixed income operations and sales. “As Academy continues to expand its business, Matt and Joe will be vital additions to the money markets department,” said Phil McConkey, President of Academy Securities. Mr. McQuillen earned an MBA in finance at Fordham University in 1994 and a BA degree in marketing from Fordham University in 1989. He holds his Series 7, 24, and 63 licenses. Academy Securities is a preeminent disabled veteran owned investment bank with strength in capital markets, public finance, fixed income and equity trading. Leadership and staff have had intensive military training prior to entering and gaining in depth financial services experience in global capital markets. We are mission driven with a high ethical code, a solid sense of accountability and strive for excellence in the pursuit of our clients’ success. Intellectual assets, strong visionary leaders and a proud team commitment bring out the best in each other for the benefit of our clients. Academy is our nation’s first and only post-9/11 disabled veteran owned investment bank and is a certified as a DVBE, SDVOSB, and MBE. The firm has offices in New York, Chicago, Boston, San Diego, Chapel Hill, Sacramento and South Norwalk.